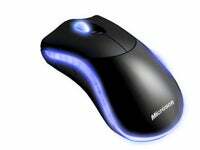 Gaming mice—how do I love thee? Let me count the ways: supreme optical laser tracking, with on the fly dpi adjustment; switchable side panels; glowing blue highlights. What's not to love? Microsoft has teamed up with gaming peripheral maker Razer to craft one mean-looking gaming mouse. The Microsoft Habu (Habu?) was designed especially for PC gamers, with not only the features mentioned above, but 7 programmable buttons; onboard memory for 5 control profiles; zero-latency technology; and more. As we've said before, the the pointing device makes the man (or woman), so if you're on the lookout for that new gaming edge, the Habu looks like it may be a worthy competitor to some of Logitech's offerings. It'll be available in October for a retail price of $69.95.